Teams are being formed now! This kickball fun day will be an annual event and include other age and ability appropriate games to include everyone. 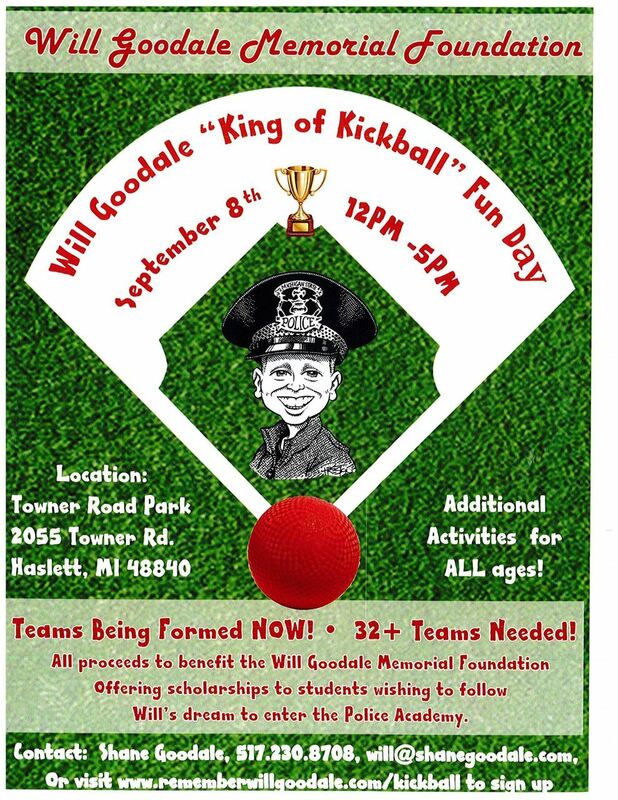 We are looking for 32+ teams to play a round-robin day of kickball to find the king and queen for the year. Food trucks and fun for all. The Will Goodale Memorial Foundation was created to memorialize the name, spirit, and dreams of Will Goodale. Will passed November 2015 after a diagnosis of a brain tumor at the age of 10. Will wanted to be a police officer, so we established this foundation to have events in his name and raise money to offer scholarships to students entering a police academy. We are a 501(c)3. Contact MABA Member Shane Goodale at 517-230-8708 or at will@shanegoodale.com to register a team, volunteer, or be involved. You can also register at www.rememberwillgoodale.com/kickball.